A fabulous morning on the Witham meant that we were up an about in the bright sunshine and heading towards Boston quite early. Again, it was new territory for all of us and as we approached the town ,we were greeted by the sight of the Boston Stump- something we have seen many times before but the approach by river certainly seems to give the clearest view and the church looked bigger than ever, as it was in our direct line of sight on the approach. Plentiful visitor moorings at Boston meant that we were spoiled for choice, however some spaces are reserved for permanent moorers and there s a handy map on the C&RT notice board. 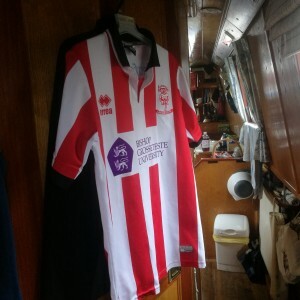 One of the first sights that greeted us was Charlie Fox Narrowboat Largamento that we had seen at Fiskerton on the Trent. 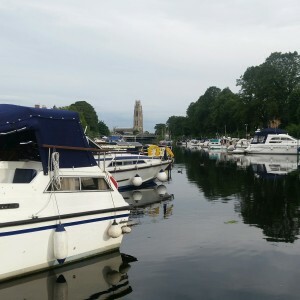 I had only spoken to Peter Ekins the previous day and told him about the sighting of the boat at Fiskerton- he’d mentioned that he didn’t know any updated details about the boat and there it was- moored next to us in Boston!! Once we’d sorted ourseleves out, we went to have a chat with Largamento’s owners and what lovely people they were too!! Continuous cruisers and in Boston until Monday, we had a great chat about boat owning, Fox boats, The List and a bit of history about Charlie himself. Oh, and put the world to rights on a few other issues as well, as you do! We had been chatting so long that breakfast turned into lunch and and then we headed off to experience Boston from the novelty of the river and by necessity, approaching on foot. Quite a few things have changed and it was hard to relate to my old self who ran the shop and worked there for 4 years! As great as the visit was, we were pleased to be heading back to the boat and some well deserved chill out time. However, the polishing bug took hold again and we attempted to clean the outside portholes, but they were just too tarnished and will need more than the elbow grease that we can offer. On the plus side though, the crass on the buckby can came up really well. 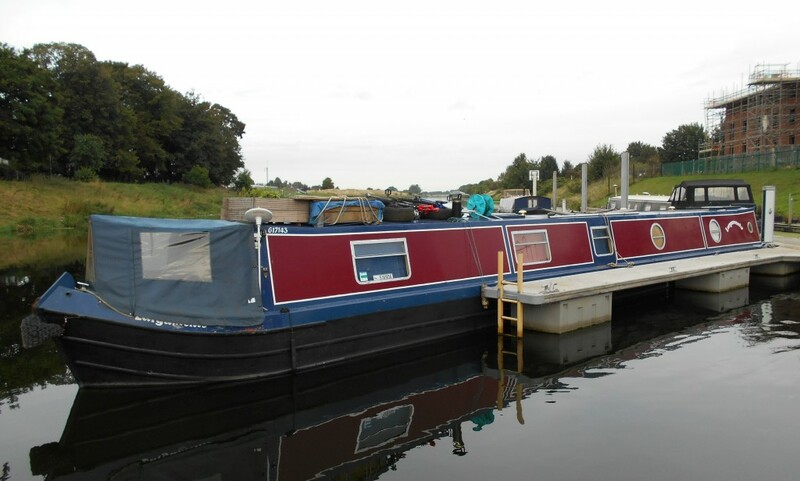 We decided to stay in Boston, we had quiet & secure moorings, lovely neighbours and no desire to move anywhere! The supermoon was a bit of a let down, as there was a lot of cloud about, but what we did see was certainly bright & did look a LOT bigger than normal! Once again though, we were searching up to the night sky, looking without much luck for the wonders of space! !